The human brain spends the majority of every waking hour thinking about these things. So today, let us put your mind at ease. With 20 ounces of USDA prime and a pair of exotic Russian sisters. Presenting Duo, a savory and seductive NoMad restaurant that’s lorded over by a tag team of sultry siblings, opening Monday and taking reservations now. In many ways, this isn’t so dissimilar from the time you broke bread at that oligarch’s castle in Omsk. Sure, the moat’s missing, but the gold-leaf accents, crocodile-skin columns, electronically backlit menus and Swarovski-crystal-tucked velvet walls: all here. Also here: the constant presence of the ethereal co-owners. One blonde. One raven-haired. 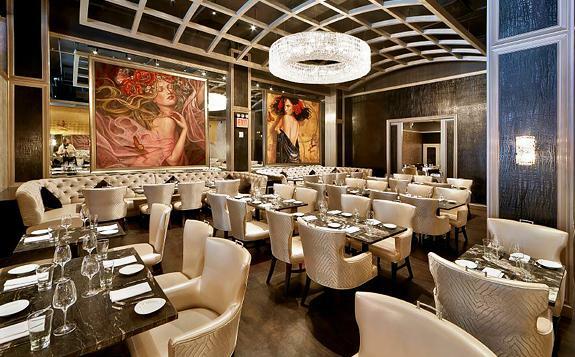 You’ll either find them fireside in the private dining room, barside at the martini-serving granite rotunda or hung on a wall… in their enormous eight-foot painted portraits. But as nice as the view may be, you’re coming here for more than the scenery—which at night will specifically be branded rib eye and “build your own” carpaccio. And during the day, it’ll be the chef-prepared lunch boxes. Imagine a Lunchable. Then add parmesan truffle matchstick fries.